Ifor is a setter whom I have come to enjoy over the last three or four years. His puzzles are always entertaining, and have covered subjects from I’m a Celebrity, Get Me Out of Here (in Magpie) through to A1 The Flying Scotsman, his last Listener. 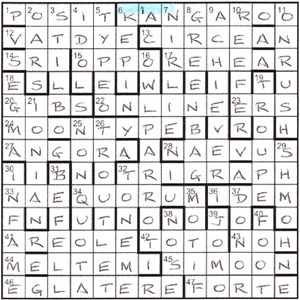 Having started this puzzle on the Tuesday after publication, it took only a couple of sessions to solve the clues, identify the letters dropped from the wordplay in eleven clues (all Os), and reach the endgame. This involved making a “nominal replacement”, “rebuilding one block of cells”, and following the instruction revealed by specific letters in the clues not affected by dropped letters or the one clue consisting of wordplay only. The Os mentioned above were 8-7-6-5-4-3–4-3-4-3-2 squares above the bottom of the puzzle … or “the ground” as the preamble called it. These letters from the clues in a repeated sequence gave Repeat one entry number six places east. However, before concentrating on that, I noticed two things. Firstly, I wondered why Ifor had chosen TYPE B and BYLINE at 5dn and 22ac, which had necessitated the preamble noting that 5dn wasn’t in Chambers; after all TYPES and SALINE would have worked. Obviously something was happening here, and it only took about ten seconds to realise that row 5 began MALT BYLINE, and Maltby had been referenced in 1ac, the clue without a definition. I have to confess here that I had forgotten all about Maltby’s role in you-know-what, so I just erased the name and tried to see what could be substituted and yet still give real words down. EGMA, IONIAN, STILB and GIBSON appeared in that order, and I realised that we were dealing with 617 Squadron and the Dambusters raid of May 1943. And that explained what needed to be done in the top row to give 617 when entry number 1 was repeated six places to the right. Of course, all the Os that were dropped from the wordplay represented the bomb from Maltby’s plane, the one that eventually exploded and burst the MOHNE dam, currently sitting in the bottom right corner as OENMH. So that needed to be rebuilt as MOHNE (giving IDEM, NOH, SIMOON and FORTE in the new across entries). A final bit of blue highlighting and Ifor’s fantastic puzzle was complete. The double meaning of the title wasn’t lost on me either, with its refence to the two skippers Gibson and Maltby, and the nature of the bouncing bomb. A couple of days later, on a pleasant evening — one of precious few so far this year — I was sitting outside one of my local hostelries. My fellow Listener solver, Mark Bull (whom you may remember from X and Y by Ron) was walking on the other side of the street. Despite desperate attempts to bury my head in my glass of beer, he spotted me and strode across the road, ignoring the screech of brakes and gesticulation from a passing motorist! “Glad to bump into you,” he said, and glad I was to be seated otherwise that’s exactly what he’d have done. “Good to see you too”, I lied, happy at least that my entry for Skippers had already been sent to St Albans and I wouldn’t be upset if Mark blurted out any unwanted help. “How so?” I asked, annoyed that I was encouraging the conversation to go on for longer than I wanted. “Well,” he continued, “At the beginning of the month, I had Googled ‘Anniversaries May 2013’, and saw that it was 70 years since the Dambusters raid. Out of interest, I did a bit of reading to remember and enjoy the details of the event. That told me everything, starting with the thematic number which would obviously be 617 in the top row. I didn’t even examine the clues later to spell out the instruction that would tell the average solver what to do. 1ac then confirmed my hunch with its reference to Maltby. “And that was before I’d actually solved any clue. Of course, when I got to 20ac Almost blended, so turned out whisky (4) and 22ac It names the author (extra stuff) (6) which were MALT and BYLINE, I could see that GIBSON would have to appear there as he was in the first run although his bomb wasn’t dropped on the Mohne. As soon as I got one of the Os which had been dropped from the wordplay, I knew it had to represent a bomb, and I pencilled in a route for the other ten. Unscrambling OENMH in the bottom right to give MOHNE was all that needed to be done when the grid was complete. “Must be off now”, he finished, and without having said anything for five minutes, I watched him stride off towards one of the other pubs in the village. I mused on how the puzzle could be solved in two totally different ways, suspecting that the average solver probably took a route somewhere in between. Somewhat stressed, I returned to my pint. This entry was posted on 31 May 2013 at 4:00 pm	and is filed under Solving Blogs. You can follow any responses to this entry through the RSS 2.0 feed. You can leave a response, or trackback from your own site.